Mysore Dasara is a Royal Festival Celebrating victory of Truth over Evil. Legend has it that the Goddess Chamundeeswari or Durga slew the demon Mahishasuran on Vijayadashami day. Dasara is a 10-day festival in the region culminating on Vijayadashami or tenth day. The day marks the successful conclusion of the preceding nine days. Vijayadashami is also a day of victory of the King and his subjects, be it in a battle or day-to-day governance. With founding of Mysore dynasty in 1399 AD by Yaduraya, Mysore has seen 24 rulers. Till emergence of Raja Wodeyar in 1578 AD, the Mysore Kingdom was a small feudatory Kingdom under the Vijayanagar Empire. With the fall of Vijayanagar Empire in 1565 AD, the Wodeyars inherited and perpetuated the traditions of Vijayanagar Empire. Raja Wodeyar ascended the throne in 1610 AD, in Srirangapatna the erstwhile capital and inaugurated the Dasara Festivities which are still celebrated with all grandeur. The most celebrated Kings after Raja Wodeyar who contributed to the cultural heritage of Mysore are Ranadhira Kanthirava Narasaraja Wodeyar (1638 -1659 AD), Chikka Devaraja Wodeyar (1673 -1704 AD), Mummadi Krishnaraja Wodeyar (III) (1799 - 1868 AD), Nalvadi Krishnaraja Wodeyar (IV) (1902 -1940 AD) and Jayachamarajendra Wodeyar from 1940 till the establishment of the Republic of India. Between 1761 and 1799, Hyder Ali along with his son Tippu Sultan ruled the State. With the defeat of Tippu Sultan by the British at Srirangapatna in 1799, five year old Prince Krishnaraja Wodeyar (III) was installed the King of Mysore on the throne of his ancestors. Wodeyars contributed a great deal towards arts and culture. Palaces, temples, the Mysore school of traditional painting, women's schools and colleges and music maestros bear witness to the liberal grants and patronage of Mysore kings. Mysore was the only highly industrialized and progressive native state in India in steel, silk, soaps and hydro-electricity. The kingdom was benefited from visionaries like Sir Mirza Ismail and Sir M. Visveswaraya who served under the Wodeyars. Mysore also has associations with the Mahabharatha and King Ashoka of 3rd century B.C. 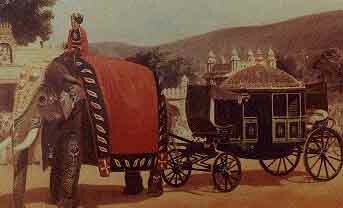 During the Wodeyar rule, Mysore reached the zenith of its glory as a fabled center of oriental splendor. Hyder Ali and his valiant son Tippu Sultan are notable figures in the history of the land. They expanded the Mysore kingdom on an unprecedented scale and by their resistance against the British, became personages of world fame.